In memory of Robert Allinson of Dallowgill who died June 10th 1852 aged 85 years. 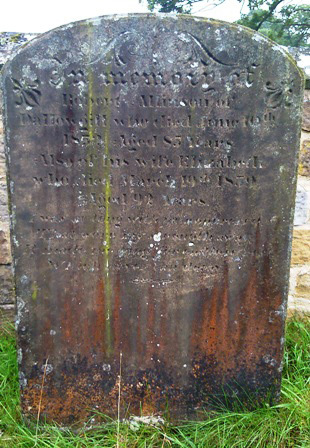 Also of his wife Elizabeth who died March 10th 1859 aged 92 years. I was so long with pain oppress’d, That wore my strength away. It made me long for endless rest, Which never can decay. Elizabeth Allinson inherited the Studley Estate from her father William Aislabie. In the 1793 Rentals of Elizabeth there was Dallow Hall, Ladyhill, The Knott and the farm which she later gave as The Vicarage and Glebe land, also Potter Lane slate mine and two small cottages. This Estate was inherited by Elizabeth’s niece, Mrs Elizabeth Lawrence, and she owned the same farms and slate mine in 1838, and also Harper Hill and Mossimire. Information from Lilian Chandler’s book.